In March 2018 we celebrated the 75th anniversary of the Torres Strait Light Infantry Battalion. 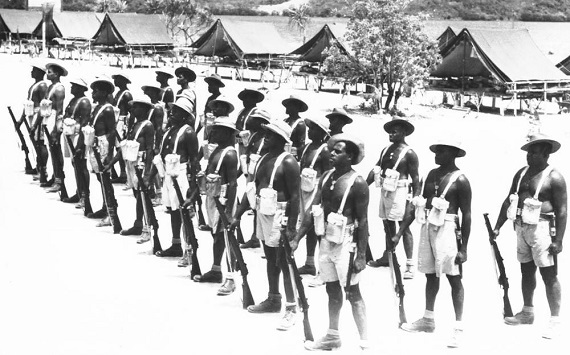 At a time when Torres Strait Islander and Aboriginal men and women were not afforded many of the rights of equal opportunity, in the Torres Strait over 800 men volunteered for the Australian Army, culminating in the official formation of the Torres Strait Light Infantry Battalion in 1943. The 75th Anniversary of the Torres Strait Light Infantry Battalion exhibition celebrated the courage and sacrifice of our forebears and First Nations Australians nation-wide to the service of their country. The 75th Anniversary of the Torres Strait Infantry Battalion showed in our Ephraim Bani Gallery from 17 March - 18 May 2018. Torres Strait Light Infantry Battalion, Thursday Island QLD 1945.